On 13th April 2005, Dr. B. K. Modi, Chairman, Ekal Global and Swami Satchidananda, Coordinator, Ekal Global visited Hong Kong and held a meeting at India Club, Hong Kong, with a group of local industrialists and professionals. There was a presentation on Ekal Vidyalaya and Sri Sohan Goenka, a well known Diamond Merchant was announced as the President with Sri Nanda Kumar, a Professional Accountant with Master's degree in Business (USA) as the Secretary to form Ekal Vidyalaya Foundation in Hongkong. Here's wishing that the new chapter carries on the good work being done by the Ekal Vidyalaya Foundation all over the world. 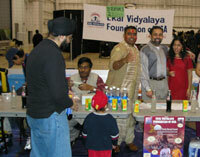 India Mela: Volunteers of Ekal Vidyalaya Foundation DC chapter had set up an information booth, children activities (games, face painting, T-Shirt painting) booth and drinks stall at India Mela held on 26-27 March at Soccer Plex. All the volunteers whole heartedly participated in these activities. Our young volunteers like Harshil (age 4), Rachit (age 7), Prateek (age 12 ) and Trisha (age 14) helped us a lot and deserve special cheers. Great Teacher Lecture: 2 April 2005 - To the heartfelt joy and appreciation of an enthusiastic audience present on a rainy afternoon, Great Teacher Lecture organized annually by the Ekal Vidyalaya Foundation was delivered at the University of Maryland, College Park, by Srimati Kamala, President of the Mahatma Gandhi Memorial Foundation and Director of the Gandhi Memorial Center in Washington, DC..... Click here for a brief report of the event by Dr. Vinod Jain. My profession is medical & I am semi retired at present. Even though I live thousands of miles away from India I love my motherland India & I shall do my best to serve in my capacity. Ekal vidyalaya is one of the best way to do it. My first vanyatra was at PALGHAR (MAHARASHTRA) on 2nd April, 05, organised by Shree ANIL KUMAR, Active Karyakarta for Ekal Vidyalay. We visited one village very much interior from the highway. There were few people like me who were visiting such school. For first time others were active karyakartas & some of the most successful industrialists of Bombay. As we entered the village we were greeted by folk music-dance & kumkum on our forehead. We visited one school to see small demonstration of teaching & in next town we saw teachers training course being conducted. Between two main events we were served simple lunch at different houses. All our hosts were very loving & the food was great! I appreciated Ekal Vidyalaya’s Karyakartas Team work, Cooperation, Discipline, Devotion & the most important attitude of service to mankind. They are instrumental in passing same values to teachers and children. Bringing villagers adivasies or vanvasies in main stream of Hindu or Sanatan Dharma is one of the best way to keep our India united. I sincerely thank EKAL VIDYALAYA movement for such a divine goal of our motherland.